Inspired by our recent trip to Savannah, Georgia, I started researching recipes for a praline cake. 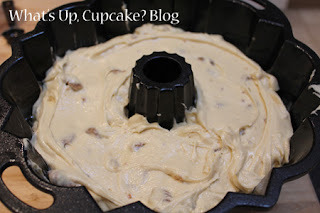 What I found was a praline loaf that I converted into a bundt pan recipe. 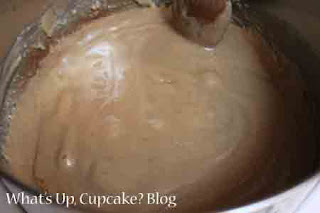 Making the pralines to crumble up within the cake was really easy. I had never made them before, but found if I just stayed attentive at the stove, there was nothing to worry about. Just follow the directions in the recipe and you'll be fine. I made them first, then started onto the cake batter. 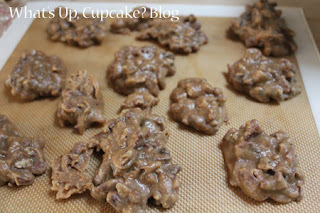 As soon as I was ready to pour the cake batter into the pan, the pralines were cool and ready to be crumbled in. The recipe requires a lot of eggs. I let mine sit out to reach room temperature though the recipe didn't necessarily call for room temperature eggs. 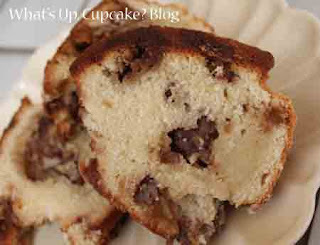 I find having all of the ingredients at room temperature helps my baked goods turn out consistently right. Slight modifications made by me. In a heavy saucepan, over medium heat, combine the sugar, brown sugar, corn syrup, butter, salt and condensed milk. With a wooden spoon, stir until the sugar dissolves. Continue to cook, stirring, until smooth and light brown, about 8 minutes. Add the vanilla and pecans and continue to cook, stirring, until the mixture reaches 234 to 240 degrees F. on a candy thermometer or the soft ball stage, that is, when a bit dropped into cold water forms a soft ball that flattens. Remove from the heat and drop by the spoonful onto waxed paper or a silpat. Let cool. Remove from the paper with a thin knife. 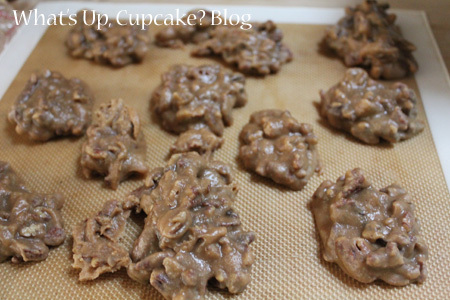 The pralines don't have to look perfect - you're just going to crumble them up for the cake. Cream the remaining butter and the sugar in the bowl of an electric mixer on low speed until light and fluffy. Scrape down the sides with a rubber spatula. In a separate mixing bowl, beat together the egg yolks with the vanilla until light and frothy. With the electric mixer on medium-low, gradually add the egg yolk mixture to the butter and sugar mixture and mix for about 4 minutes. In another bowl, combine the flour, baking powder, and salt. With the electric mixer on medium speed, alternately add the flour mixture, a third at a time, and the egg whites, a third at a time, to the butter and egg mixture, beating for 2 minutes between each addition. Scrape down the sides of the bowl as you mix. Add the lemon zest during the last 2 minutes of mixing. 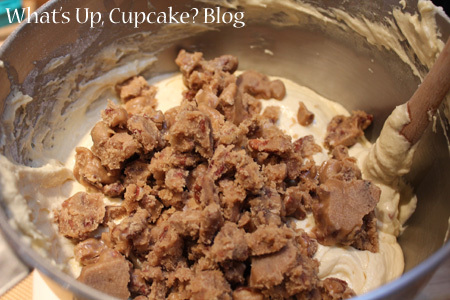 Crumble the pralines and add to the batter. Also add the rum. Mix until ingredients are incorporated. 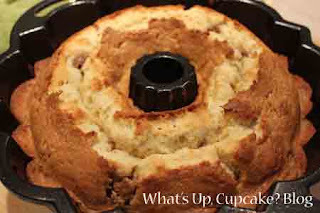 Pour batter into your bundt pan. Bake for approximately one hour or until a toothpick inserted comes out clean. The cake can be stored by wrapping them in waxed paper, then plastic wrap, then in foil. It does not need to be refrigerated.